Murder by Gaslight: A Christmas Eve Murder. John F. Foley Pleads Guilty to Manslaughter in the First Degree. The John F. Foley, alias “Mud,” pleaded guilty yesterday before Judge Gildersleeve in the Court of General Sessions to manslaughter in the first degree, in killing Dennis Carney. He was remanded until to-day for sentence. The defendant and the murdered man were members of a west side gang who committed robberies from the outside of stores and from parcel wagons. On Christmas Eve, 1886, Carney’s body was found toward midnight in a gutter on Twenty-seventh street, near Eleventh avenue, and on examinations it was seen that he had been stabbed through the heart. 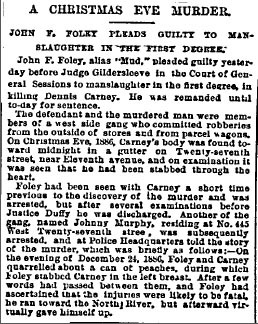 Foley had been seen with Carney a short time previous to the discovery of the murder and was arrested, but after several examinations before Justice Duffy he was discharged. Another of the gang, named Johnny Murphy, residing at No. 445 West Twenty-seventh street, was subsequently arrested, and at Police Headquarters told the story of the murder, which was briefly as follows:— On the evening of December 24, 1886, Foley and carney quarreled about a can of peaches, during which Foley stabbed Carney in the left breast. After a few words had passed between them and Foley had ascertained that the injuries were likely to be fatal, he ran toward the North river, but afterward virtually gave himself up.